A quick post this morning sharing a Christmas card I made last week inspired by Debby Hughes’s Believe in the Magic card. I love the intense red colour and the gold. So rich and festive. I decided to use those colours to create a card of my own. 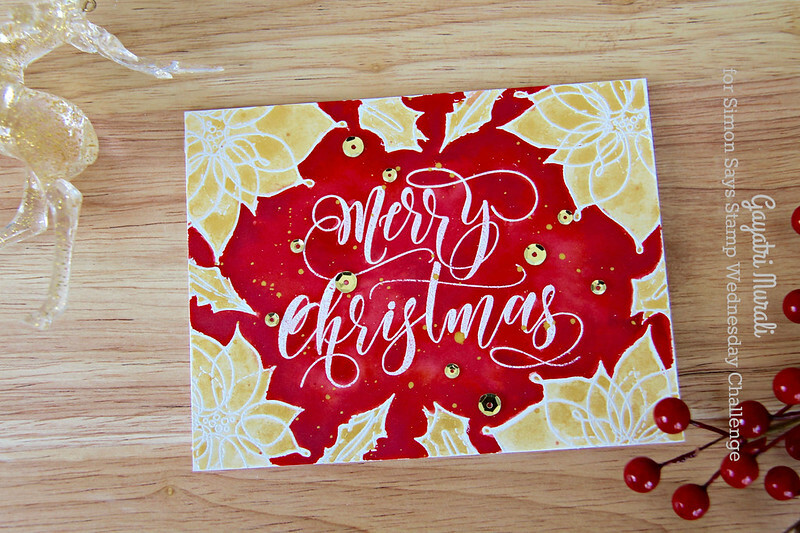 On a watercolour panel cut to the size of the card front, I white heat embossed the sentiment from Merry Christmas stamp set released during Stamptember. 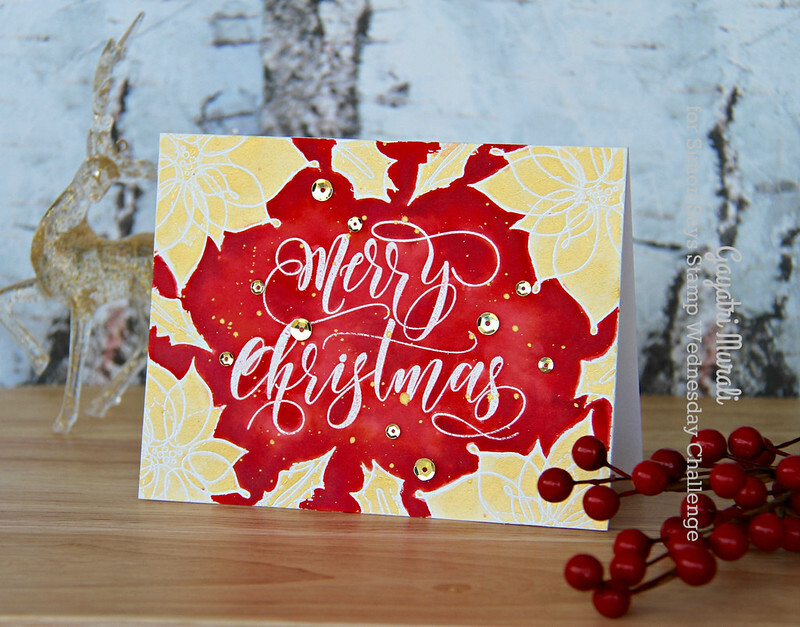 Then on the edges of the panel I white embossed the poinsettia flower and leaves from the Winter Flowers stamp set from Believe in the Season collection. Both the stamp sets are from Simon Says Stamp. Then I sponged Aged Mahogany distress inks on the centre of the panel. I went all out with it and applied a LOT of the ink. Then I used brush and water and spread the colours out evenly on the background avoiding the flowers and leaves. I added more colour to the nooks and crannies to add depth. I let the colour dry. Then I went on to colour the flowers and leaves using Finetec Gold Mica watercolour. I let the gold watercolour dry. I spattered some gold all over the panel. I wanted subtle spatters as I was afraid of ruining my card by adding a lot of spatters. Debby is a pro in watercolouring and she knows what she is doing. Me? I am learning. Better to keep it subtle when trying for the first time. Will experiment with more spatters with time and practice 🙂 Anyway, I added gold sequins to finish of my card. Thanks for stopping by my blog today. Have a wonderful day! stunning Gayatri. The dark red background makes the gold flowers totally amazing. wow stunningly beautiful cards !